Colleges are good at getting people enrolled. They get kids lined up with education loans. The money goes to pay exorbitant prices on textbooks. It pays for meal cards. Tuition is crazy high. Parents go along and shell out until their bank accounts are barren. What colleges are not good at is getting the kids degrees. And those without those degrees have a hard time getting a good job to pay back a student loan. Instead, they fall into delinquency, starting off life saddled with an unpayable debt. The analogy with housing is unavoidable. Do you remember 2007? The peak in the price of housing had come and gone. But the leverage of the major investment banks was peaking at over 30 times at Bear Stearns, Merrill Lynch and Morgan Stanley. Freddie Mac announced it wouldn’t buy risky subprime mortgages and mortgage-related securities. Subprime lender New Century failed. Bear Stearns liquidated two hedge funds that invested in mortgage-backed securities. The interbank market froze completely. A deal to take Sallie Mae private fell apart. And in the middle of 2007, subprime delinquencies reached 15%. Catch that number? It’s the same as the student loan delinquency rate today. Of course, when the subprime delinquencies hit 15%, that market was circling the drain, but few people realized it. In contrast, more and more people are realizing that there is a serious problem with student loan debt. Curiously, Sallie Mae stock (SLM) rose on the delinquency news. But then again, the company would appear to be very much a going concern. Core earnings for 2012 were more than $1 billion, benefiting from the lowering of loan loss reserves and operating expenses. Charge-offs increased to 4.19% of loans in repayment. Not to worry, says Sallie Mae: It expects that to decline in 2013. The company pays a 50 cent annual dividend, so it sure beats money market rates. And SLM says it will make $2.30 a share this year. TransUnion points out that “more than half of college graduates under 25 are unemployed or underemployed — the highest rate in 11 years.” This makes going back to school and racking up debt a reasonable option. “With the economy either in recession or slowly coming out of it during the study period, we had expected that student loan balances might increase as consumers frustrated with the job market went back to school to work toward a different career path,” said Ezra Becker of TransUnion. “However, the rate of growth we observed was truly eye-opening,” he added. What kind of lender would be lending money to permanent students with bad prospects? The government, of course. “Between 2007-2012, federal loan balances jumped 97%, while private loan balances only rose 4%,” writes TransUnion. While traditional colleges wrestle with the quandary of passing out degrees, you might wonder if Sallie Mae’s dividend is safe. Everything looks peachy over there. But one should remember Sallie’s sister, Fannie, that paid $1.18 in dividends in 2006 and $1.50 in 2007. The stock traded just below $66 a share in August 2007. Today, it fetches less than 28 cents, and dividends are a distant memory. 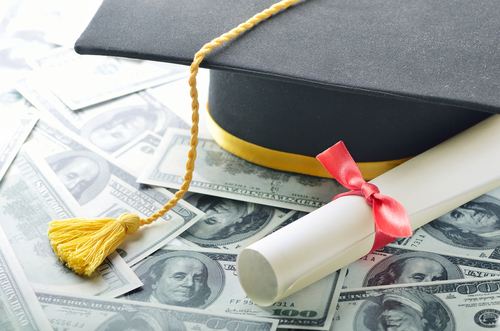 Get ready: We could be on the precipice of a wild ride in the student loan market. How it will play out in real life will be as surprising as the wreckage of the housing crash.